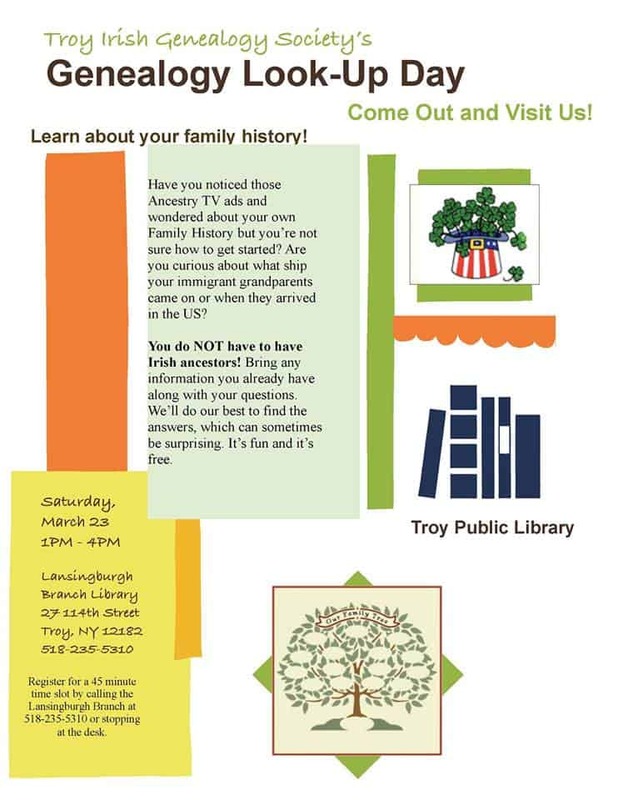 The Troy Irish Genealogy Society will be at the Lansingburgh Branch of the Troy Public Library on Saturday, March 23, from 1 to 4 PM for a Look-Up Day. Have you noticed those Ancestry TV ads and wondered about your own family history, but you’re not sure how to get started? Are you curious about what ship your immigrant grandparents came on or when they arrived in the US? Members of the Troy Irish Genealogy Society (TIGS) will be at the library to perform online look-ups to help you out. You do NOT have to have Irish ancestors! Bring any information you already have along with your questions. We’ll do our best to find the answers, which can sometimes be surprising. It’s fun and it’s free. This program is free and open to the public. Call the library at 518-235-5310 to reserve your 45-minute consultation spot.